My thoughts on my favorite authors. My favorite of the different covers for this book. Anthony Lawton, of the Rosemary Sutcliff blog, asked his readers to write in about why they like her books so much, which is their favorite book, which is their favorite character, and why. This is my response. It is also the first in what might be a “series” of posts for me, called the “Author Pantheon.” These posts will be my thoughts on the writers that I, personally, think are the greatest. Mostly fantasy authors, though in the case of Sutcliff this includes historical fiction. The posts differ from my “Features” in that they are all my thoughts and ideas, whereas “Features” are mostly the works of others that I find inspiring and relevant. Now, can I summarize why I love Rosemary Sutcliff’s writing so much? Ah, that is hard. To figure out the nuances of why her writing style seems to affect me more than almost any other. Hm. I have used the phrase “textured grace” to describe it before, though that is more a poetic phrase that only scrapes the surface. She is able to paint beautiful pictures in my mind without over-reaching into “purple” prose. Her settings and characters feel real, down-to-earth, even when they become mysterious (as in the Little Dark People and the distant Scottish hills they live in), magnificently epic (Ambrosius, particularly in Sword at Sunset), deeply dramatic (Aquila’s meeting of his sister at Hengest’s camp in The Lantern Bearers, or the end scenes of the same book), or rousingly adventurous (as in the chase scenes of Eagle of the Ninth or the intrigue of The Silver Branch). But other authors of the highest caliber have managed that kind of beautiful balance as well. I haven’t found the words yet to communicate what is truly so unique about Sutcliff’s writing in comparison to the other greats of English literature. She writes strong male characters with solid moral centers, in a believable and complex fashion — that’s part of it. Many excellent writers fail at at least one aspect of that (usually with the solid moral sense or the complexity). But others manage such characters too. About Sutcliff, I can only attest to the affect she has on me. Beginning a book of hers, whether a new one or an old one, is something like returning to a dear friend after a journey. Reading a new book of Sutcliff’s is like catching up on your friend’s life, while rereading one is like reminiscing about good old times. I guess that says one more specific thing about her: she’s invested in her stories. Some authors, even great ones, feel slightly distant from their stories. Not her — she’s telling them directly to you, the reader, and she wants you to listen. I like that. 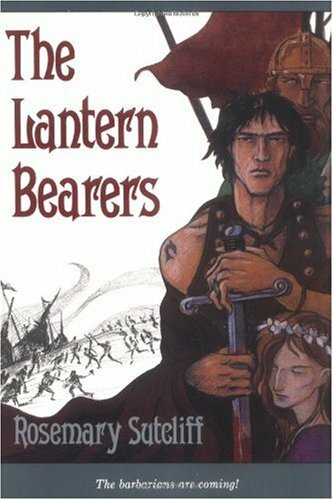 My favorite book of hers is The Lantern Bearers, and the character that moved me the most is Aquila. It was amazing how clearly she saw how Aquila saw himself and how others saw him. To see him struggle for so much of his life against himself, against the bitterness that he held and the hardness he built up in himself, and to finally find peace so late in his life…well, it’s just beautiful. His relationship with Ness is also fascinating, since they both have to learn, gradually, to forgive and love each other. It’s not quite a romance, I don’t think (and part of me wishes it was), but I do think it becomes love. I don’t know if I’ve read another novel so tender and mature at the same time. That this all comes in the midst of great adventure and intrigue helps too!